With the official licenses of Ferrari and Microsoft, the right steering wheel for all lovers of fast racing has been created. The Thrustmaster Ferrari 458 Italia steering wheel is a combination of cutting-edge technology and design. 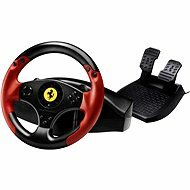 This set of a steering wheel and pedals was produced as a faithful replica of the Ferrari 458 Italia handling, and you can enjoy the ride as if you were sitting in that car. Race, for example, in Forza Motorsport 4 with maximum realism. For the best handling, the steering wheel is rubberized to prevent slipping out, which allows you to go through every turn with ease. 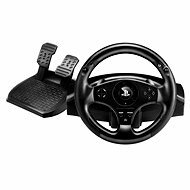 The possibility of a 270-degree rotation, as well as a large diameter of 28 cm give the steering wheel even more realism. 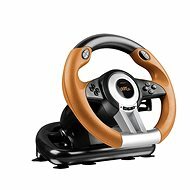 What kind of a steering wheel set would this be if it did not include pedals? In this set set, they are especially well-crafted. They were created with the exact same angle as found in Ferrari 458 Italia. In addition, the brake pedal has magnetic resistance for an even better experience. The sequential transmission located on the steering wheel is made of metal and designed exactly in the style of Ferrari GT. Other controls include a total of 8 buttons and an 8-way D-pad labelled ‘ENGINE START’. Change the game settings directly during the race. Using the multifunction Manettino interface, you can, for instance, change the camera view on the fly. Upon a change of settings, the switch will return to its original position. The Thrustmaster Ferrari 458 Italia steering wheel can mounted to any table with no problems. A firm mount further improves your driving experience. Race on your XBOX360 console like never before. The steering wheel is compatible with all XBOX360 games, and you can also connect it to your computer via a USB 2.0 port. For Microsoft Windows Vista and 7 users, the device works immediately after connecting, while Microsoft Windows XP users must download the necessary drivers. Racing wheel with pedals Done! Steering wheel with pedals Done! 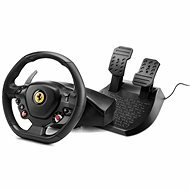 For shipping to other EU countries visit this page Thrustmaster Ferrari 458 Italia. Für Versand nach Deutschland, besuchen Sie bitte Lenkrad Thrustmaster Ferrari 458 Italia. Chcete doručit zboží do Česka? Prohlédněte si Thrustmaster Ferrari 458 Italia. Chcete doručiť tovar na Slovensko? 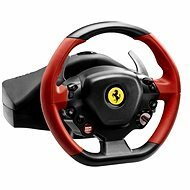 Prezrite si Thrustmaster Ferrari 458 Italia. Für Versand nach Österreich, besuchen Sie bitte Lenkrad Thrustmaster Ferrari 458 Italia. 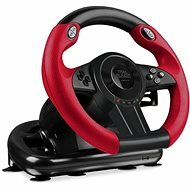 Magyarországra történő kiszállításért tekintse meg ezt a termékoldalt: Thrustmaster Ferrari 458 Italia.